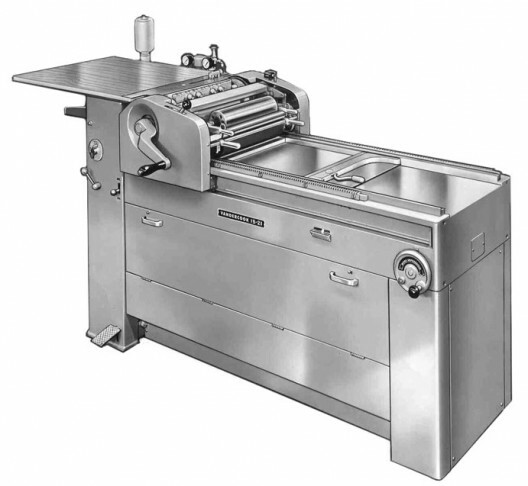 The 15-21 was the last model to feature the old-style removable top frame oscillator and bottom frame form rollers and the first to include a automatic wash up unit, a doctor blade that squeegees solvent-diluted ink from the ink drum. Standard equipment included an adjustable bed and adjustable travel cylinder trip. Options such as the ink feed and “Sprayset” ink setting system typically no longer function due to neglect. Maximum form: 14 ½ × 21″; maximum sheet: 15 ¼ × 23″. There are nineteen 15-21 presses in the Vandercook census.